Last year brought the Bulletin of the Atomic Scientists’s famed Doomsday Clock as close as it’s ever been to midnight. This year’s update will test if you’re a glass half full or empty person. The clock is at the same daunting precipice it was last year thanks to the “two simultaneous existential threats” of climate change and nuclear war, as well as growing concern over efforts to debase truth and information warfare. 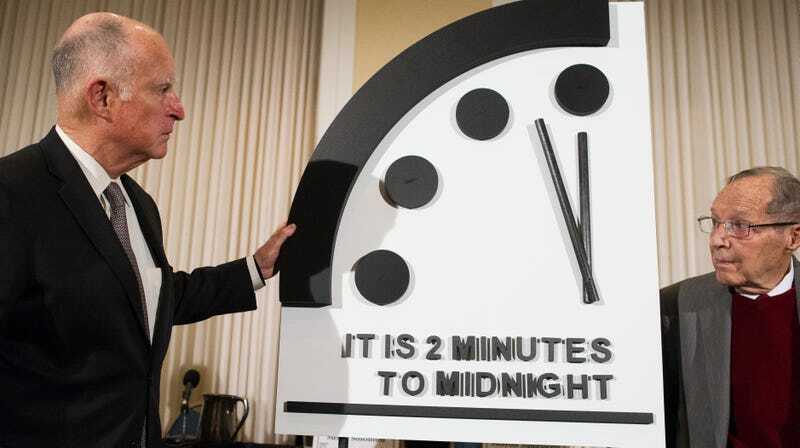 The Doomsday Clock is a charming relic of the Cold War, or at least, was until it started ticking closer to midnight. The Bulletin of the Atomic Scientists initially conceived of the clock to measure how close the world was to nuclear annihilation starting in 1947. But starting in 2007, it expanded to consider climate change. And not surprisingly, that’s been sending the clock marching closer to midnight. In 2018, it landed at two minutes to midnight, tying 1953 for the most dangerous the world has ever been. And we’re still there in 2019, living in a world that the clock setters call the “new abnormal” at a press briefing today. It’s a risky liminal space to inhabit, one where complacency could spell disaster for humanity. “We appear to be normalizing a very dangerous world in terms fo the risk of nuclear weapons and climate change,” Rachel Bronson, the Bulletin of the Atomic Scientists’ president, said at this year’s anxiety-inducing press conference. These End Times-keepers choose to keep the clock at two minutes until midnight for a few reasons. On the nuclear front, new missiles being deployed by Russia, North Korea’s continued instability, and President Trump’s erratic behavior are all raising the risk of nuclear war, unintentional or not. Cyber warfare is also a destabilizing force on nations as are attacks against our shared reality. Those attacks on reality have been particularly pronounced when it comes to climate change, which is creating a true nightmare scenario of inaction. Humanity is entering a critical decade that will go a long way toward deciding what type of climate we live in. And yet despite that, carbon emissions rose in 2018 and the world’s landmark climate agreement is in serious trouble. And of course the U.S., the world’s largest historic carbon emitter, is pushing full speed ahead with fossil fuel production. “The new abnormal climate we have is already extremely dangerous and we’re moving onto a path that will make it much more dangerous still,” Susan Solomon, a climate scientist at MIT, said at the briefing. None of this is to say we have to reach midnight. It still feels pretty bleak being this close to annihilation, but the clock has gone backwards before. Bronson said the whole point of the clock is to get people talking about the risks humanity faces and demanding action to address them. The world just need to hurry it up because we are running out of time.